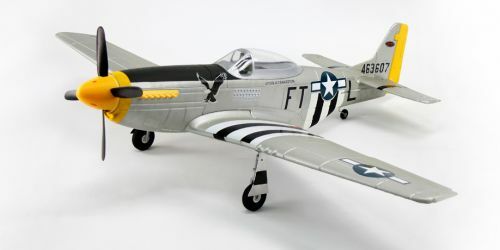 The new P51D Mustang by Dynam is a true scale aircraft and comes with pre-installed electronic retracts. The stunning look makes this super realistic in the air and taxiing on the ground. The P51D is an aircraft that is super stable and capable of maintaining flight at super slow speeds that allow novice to master flight mechanics with ease. It will easily take off from any smooth surface on its scale landing gear and made from a high strength EPO-foam for added durability. Powered by a high powered electric brushless motor provides a thrilling flight of over 50mph for up to 8-12 minutes. Additional Products that may be needed. - Additional Products that may be needed.